Interestingly though a particular yajna is performed in a particular place, Shri Swamiji organises in such a way that the young and the school going tiny tots as well as the old can participate sitting in their own home. For instance, in 1997, for "Koti" (one crore) likhita (written) Shri Rama Nama Japa Yajna, hundreds of note books in which thousands have chanted and written in their own handwriting the mantra, Shri Rama Jaya Rama Jaya Jaya Rama, arrived at the venue. The enthusiasm of the devotees was so great that as against the targeted one crore, 23 crore mantras arrived at the scene! This year, April, 2000 for the mammoth Shatakoti (one hundred crores - one billion) Shri Rama Nama Japa Yajna, organised in commemoration of the 525th Foundation Day of the Samsthan and Shri Swamiji's Silver Jubilee of ascending the gurupeetha, a devotee could chant any number at home, keep a daily record in a card supplied by the math and send it over to Partagali where the yajna took place. "Among all the yajnas, japa yajna is the greatest," so declares Gita and Shri Swamiji actually propagates it by word and spirit. The Math runs Shri Jeevottam Vaidik Sanskrit Pathashala and the admissions are open to all the pupils of the Samaj. 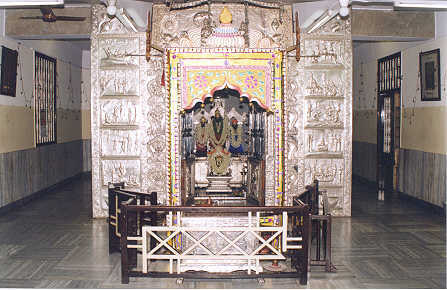 The Decorated Door of the Sanctum Sanctorum with silver laid carvings depicting the scenes of Ramayan. 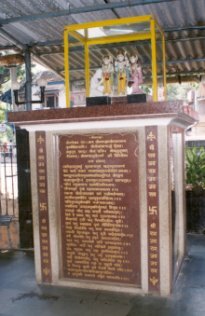 The Shrine where the note books containing more than 20 crore written Ram Nama Japa, by hundreds of devotees, received from all over the country, for the Yajna held in Oct., 1997, are preserved for posterity. 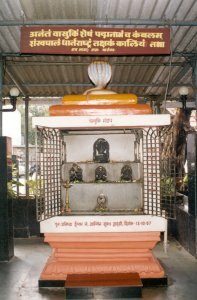 Navagriha Mantap in Shri Ram Mandir where one can have the darshan of all the mythological nine planets in the form deities. 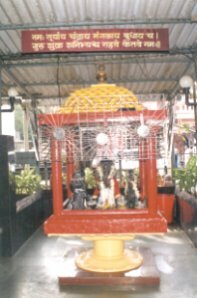 Vasuki Mantap: The symbol of Naga worship by GSBs.